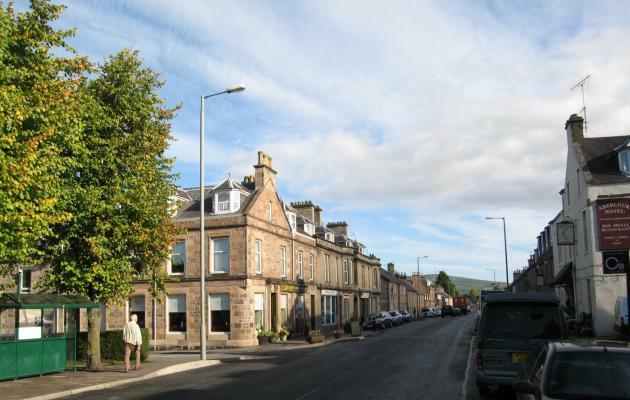 Aberlour High Street @ High.St - High Street shops and High St businesses. Large Google map of Aberlour High St.
Charlestown of Aberlour, to give the village its full name, has its high street and houses running parallel to the River Spey. 'Charlestown' came from Charles Grant who founded the village in 1812, naming it after his son, also called Charles. Aside from some wonderful views of the Spey, Aberlour is also a popular stopping off point for people on the Speyside Way, a long distance walk of 84 miles (135 km) that goes from the Cairngorm Mountains to the Moray Coast. Walkers, world renowned for their shortbread, are based in Aberlour and have a proud heritage going back to 1898. Naturally with all this good food on the banks of the Spey, you will not be surprised to find Aberlour distillery ready to show you around. Being Speyside, there are many other distilleries on the Malt Whisky Trail, including: Elgin, Forres, Keith and Rothes. If you need a break from the heady fumes, try the Speyside Cooperage as it's one of the most fascinating places we've seen for a while; or Ballindalloch Castle, just 8 miles (13 km) down the road. This spectacular castle is the home of the Macpherson-Grants and has some lovely gardens; well worth a visit. Aberlour shops will be added soon. Visit Aberlour has lots more information about the area. Detailed maps and information from RPA Smith Street Maps web site. Aviemore and Grantown-on-spey are also close by.